PM takes off for Russia to meet with President Putin. The two are to discuss the tense situation on Israel's northern border. Prime Minister Netanyahu embarked this morning, Wednesday, on a flight to Moscow, where he is to meet with Russian President Vladimir Putin later today. "I am now leaving for an important meeting with Russian President Vladimir Putin. The meetings between us are always important and this one is especially so,” Netanyahu said shortly before his departure. 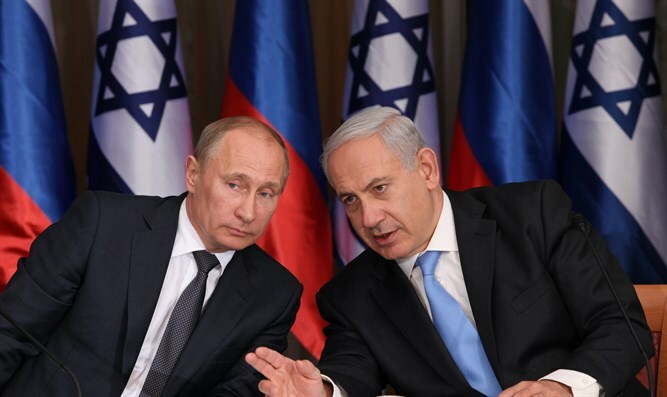 “In light of what is currently happening in Syria, it is necessary to ensure the continued coordination between the Russian military and the IDF." According to some of the reports, Israeli planes fired missiles at Iranian targets near Damascus. Syria’s official news agency SANA said that the Syrian army intercepted two Israeli missiles fired towards a district near Damascus. Rami Abdel Rahman, director of the Britain-based Syrian Observatory for Human Rights, told AFP that missiles targeted an "arms depot belonging to Hezbollah and the Iranians". The monitor said that at least nine pro-government fighters were killed in the missile strike, including members of Iran's Revolutionary Guards and other Iranian-backed combatants. Earlier on Tuesday evening, the IDF asked authorities in the Golan Heights to open and prepare missile shelters over "irregular activity by Iranian forces in Syria", across the demarcation line.